I had to be talked into going to the Minnesota Harvest Horse Show (which I will refer to as “Harvest” for the remainder of this blog post). It took a lengthy conversation with Elzabeth, during which she repeatedly tried to get me to understand that I probably ride better now than I did four years ago, when I last attempted to show indoors. She had to pound it through my head that in all likelihood, I was not going to go in and fall off at fence 4, or get jumped off and break my hand on my jaw on the way down, or find myself in Nikki’s stall at the end of the day crying. Nikki and I have been on a wild ride of an unbelievably amazing summer, so it may seem strange that I needed this much of a push to go to our year-end show. There is an explanation, though. The last time I showed inside with Nikki, we were at Harrisburg for the Pennsylvania National amateur-owner jumpers. Nikki had experienced Harrisburg before and was unfazed by the atmosphere there, but I more than made up for her lack of nerves. Although I went to the National Horse Show when it was in Syracuse (N.Y.), Harrisburg was different; it was a much bigger deal in my mind. I might as well have been at the Olympics. So I did the predictable, if not logical, thing of completely forgetting how to ride. In our better round, I only broke my hand when Nikki jumped me out of the tack. Our other round, I fell off because I leaned up Nikki’s neck. We scratched from the final class because I was sufficiently terrified that I didn’t want to go in the ring. Thank heavens there wasn’t a live feed that year; I’m sure I would have been absolutely ripped apart online if people saw me ride. Suffice to say, it was not an ideal first Harrisburg. It stuck with me, and I didn’t go to another indoor show until this year. Harvest is a great show for me, as a working amateur, because it’s in St. Paul, Minn. I can stay in my apartment, rather than in a hotel, and the added bonus is that I can go to work while I’m showing. Since I take care of Nikki at the shows, I was always there by 6 a.m. to feed her and muck her stall. There were several mornings where I went to the lab as soon as I finished with Nikki, and if I was efficient, I finished my lab work before dawn. It was super convenient and gave me more time to be at the show when I needed to be getting ready. The ring at Harvest is a coliseum that you need to walk up a ramp to get into, and before our first class (a 1.30-meter), Nikki took an interest in looking in the ring to watch the horse before her. She’s not very big, at not quite 16 hands, and had to stretch as much as she possibly could just to see over the gate. It made me laugh, and I needed that; I was nervous even though the jumps weren’t very tall. We jumped a conservative double clear, and I felt comfortable putting her in the welcome stake the next day. I think Nikki and I grew up a lot this summer. It’s a strange thing to say, given that she’s 18 and I’m 23, but I really feel that I got better at the mental part of this sport and because of that, Nikki felt my confidence and was less of a diva about everything. Nikki has always been funny about footing, and I pick shows carefully because of that. She wants to feel like she has a lot of grip when she goes to jump, and if she feels at all insecure, she doesn’t jump well. I always put studs in behind when we jump, even if they’re tiny road caulks that really don’t do anything, because she’s more comfortable with that setup. The schooling ring at Harvest is a little bit of a challenge because it’s very small. I knew that I didn’t want to jump anything huge in there, although my normal schooling routine ends on a big ramped oxer and a very tall vertical. There wasn’t enough space for me to feel comfortable jumping that high, so I planned to cut off my schooling for the welcome at about 1.40-meter and go on that. It was a great plan until Nikki stumbled badly right in front of our last oxer and went through it. I stayed on, and we went back and jumped it again—horribly. I told my mom to put it down to 3 feet, the height we start at, but at that point, Nikki was so frantic that she stopped and I fell off. Last year, or even earlier this year, I think I would have given up at that point, and assumed it wasn’t our day. This time, I hopped back on and jumped a low vertical back and forth until Nikki settled down. But rather than end on that, I decided to send her into the ring to try the welcome; the coliseum is much bigger than the schooling ring and the footing is really good. I figured if she didn’t feel comfortable, I would pull up. It wasn’t our best round by any means, as we had two rails, but I was really impressed that Nikki jumped better and better as she went around and realized that she wasn’t going to trip. The way she ended, jumping beautifully, made me wonder if I could tweak our schooling routine and still be successful in the ring. I love conducting experiments, as that’s a major part of my job. I decided that this schooling plan change was going to be another experiment, just one with instant feedback. I normally don’t do more than three classes in a week, but I didn’t want to go into the grand prix not knowing if this routine switch would be successful or not, so I entered Nikki in the high junior/amateur-owner classic to use it as a trial run. My hypothesis was that jumping fewer jumps and smaller jumps would be adequate preparation for Nikki. Granted, my experiment had a sample size of one, which obviously is not statistically significant, but it served my purpose. Rather than jumping a bunch of oxers and then a tall vertical, I just jumped a vertical four times: twice at about 3 feet, once at 3’6”, and once at 3’9”. I sent Nikki into the ring on that, even though we were showing over jumps that were much larger than that. She knows her job and she watches the jumps carefully, so I wasn’t worried about having rails because of the height difference. I was a little concerned that we might really overjump but not scope out (Kip calls this “helicoptering”), but was prepared to use extra leg at the first few oxers just in case. As it turned out, Nikki was fine, and aside from one hard rub, didn’t even touch the jumps. I was a little too slow in the jump-off and ended up with 3 time faults, but that ended up as the best score, and we won a classic for the first time. I’m not ashamed to admit that this fulfilled a very materialistic goal of mine—I really wanted to win a cooler—and absolutely baffled my husband, who thought I’d won a drink cooler when I called him. He was quite surprised when I showed up at home with a horse blanket! Given our success in the classic, I thought sticking with the new schooling plan was adequate preparation for the grand prix, although not jumping bigger than 3’9” going into a national standard prix is a little daunting. The course seemed inviting to me, with some technical lines, but nothing insane given the size of the ring. I just wanted a solid round with a good experience, and I would be over the moon with a clear round, but knew that expecting a clear round in our first indoor grand prix (that was a night class) was not necessarily realistic. Nikki schooled beautifully, and she really was fantastic in the ring as well. We, unfortunately, had a rail at the second fence because I didn’t get her there straight and then took my leg off, but she jumped really well the entire night. I was thrilled with her. We also had some time faults (there were a lot of time faults that night, I was not the only one to not get in under the time), and ended up getting squeaked out of the ribbons by 2/10 of a second at the end of the night. I was disappointed—to be that close is frustrating—but I was so happy with Nikki that it didn’t matter. Historically, in the past few years, my last class of the year is disastrous. I used to put so much pressure on myself about it being the last opportunity (because I don’t show in the winter) that I would fall apart. I’m so happy that our year ended on such a positive note. Nikki jumped fantastically all summer, and I never had a class where I came out of it going “man, I wish she had just done her part.” I could gush about her for another 10 pages. She is just amazing. I’m also pleased with how I handled this show season, although I feel like I’m patting myself on the back or something and it feels uncomfortable. I had to make a lot of decisions this summer that previously were in Kip’s hands, and I’m glad that I have the tools and knowledge to make good choices and end up with good results. There were two major opportunities for things to spiral downward this year, and I’m really proud of myself for being able to make the right calls to keep that from happening, and making the right choices for my horse. I’ll have a longer reflection coming in a few weeks. I want to wrap up with saying a huge thank you to everyone on Team Wondermare. There are a lot of people and it would take a lot of space for me to thank everyone individually, but thank you to everyone who supports us, takes care of Nikki, and has become our friends over the years. I know we wouldn’t have a modicum of the success that we have without everyone who is there for us, and I deeply appreciate everyone. Emily Pope, 23, started her relationship with Seize The Moment, an off-the-track Thoroughbred and a chestnut mare, in 2006 and they began in the junior hunters. 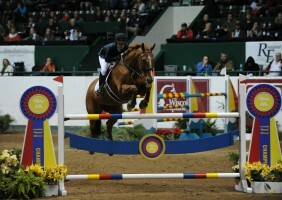 Emily quickly realized “Nikki’s” talents lay in the jumper ranks, and they worked their way from the junior jumpers to the grand prix. She rides with Kip Rosenthal and Elzabeth Lampert. Emily graduated from the University of Minnesota in 2013 with a B.S. in animal science, spent a semester studying aboard in Madagascar, and now works in cancer research.Read all of Emily’s blogs.